A couple of warnings before I launch into this weekend's post. First, just so you're all aware, today's venture into the world of comics might take a hard left turn at one point into the Kingdom of Rant, so please don't think any less of me when it's all over. 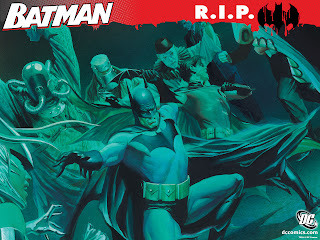 And second, there are spoilers throughout concerning DC's event comic, Batman: RIP. Now, granted, the story wrapped up a few months back, and the hardcover collection has been available on stands for quite some time now, but I figure better safe than sorry, right? So, if you haven't yet read the book and you plan to, I'd recommend skipping this post. Oh, and here's a third caveat. That second warning? About spoilers and things? Yeah, that's probably not actually true. See, this post is going to be what I think RIP was about, and my interpretation of the book might very well be...um...let's say...completely not right, or even close to what (writer) Grant Morrison and (artist) Tony Daniel were going for. So, while there will be (very) basic plot spoilers, there's also the (very) real possibility that, if you read this post and then go read the book, you'll see that the things I "spoil" may...not...actually...happen...in the book. So now that I've scared away a good portion of our readership, that just leaves me and you to discuss the...curiosities...of Morrison's story. So, let's get to it, shall we? Now, I've talked about my problems with stories weighted down in years of continuity before on this blog, but it bears repeating since this post will focus quite a bit on the issue. Obviously, continuity pertains mostly to the Big Two publishers, namely Marvel and DC, since they have years and years of books and characters and stories. And each book and character has years and years of history and stories and friends and lovers and, well you get the idea. And that's great, and it's obviously a big part of what makes reading comics so much fun--the medium is designed to tell a never-ending string of stories with characters who don't age. Or, if and when they do, it happens very slowly. Like, Bart and Lisa slowly. As I've said, I started reading comics about six years back, so I'm just not familiar with many ancillary characters, even those that appear in major titles such as Batman or The Avengers. And I guess because of this, I have a very firm belief that, while continuity is fun and all, stories should never be restricted by continuity. If you have a great story to tell about Peter Parker and Mary Jane Watson, then by all means tell the story, even if current events do not recognize MJ and Peter's marriage anymore. And you can tell that story "out of continuity," as a separate mini-series or something (like Loeb and Sale's Batman: The Long Halloween, for example). Conversely, I also feel that continuity can be fun--as long as knowledge (or lack thereof) of previous events in a character's life doesn't act as a hindrance to reading and understanding a book that's currently being printed. Shout outs to previous runs on titles are always kinda cool, as long as the writer doesn't go overboard. But it's when, for example, you need to know 20-plus years of X-Men continuity just to have a clue as to who the heck the characters talking and punching things are that I draw the line. "It will read better in trade. It will read better in trade." And yet, there I was each month, buying issue after issue of RIP, hoping that things would get better. And less...um...confusing as all get-out. And each month, I'd read the book and go, "Um...I'm confused as all get-out." But I stuck with things, and held fast to the notion that this story in particular is one that will read better once it's collected. So I read the arc until its completion and pretended to be hip enough to understand and get Grant Morrison's trippy story that called forth decades-spanning continuity knowledge. There were several, "um...what just happened?" moments along the way and I have to say, I had a hard time figuring out what in the heck was going on as the books shipped. This led to my getting kinda disappointed by the story. But, like any good, Crazy Comics Person would do, I bought the Deluxe Edition Hardcover about a month after the final issue wrapped to re-read and try to figure things out. Before I jumped back into the story, though, I wanted to forget as much of what I had previously read as was possible (this came pretty easily, actually). So I let the book sit on my shelf, still in the cellophane wrap from the comics shop, for another couple of weeks before finally breaking the seal and cracking it open. I also decided to read the trade in two sittings--half and half. That way, I could stay on top of plot twists and references to earlier issues. This helped immensely. But, the thing that really made my most recent reading such a different, and dare I say, utterly enjoyable experience, was that I read a quote from Morrison in the latest issue of Wizard Magazine. In the article, which serves as a director's commentary-type look at the mini-series, Morrison clears up a few things that had me at a loss. The most important of which being the villains in the series are not a group of old and forgotten Bat-foes, but new characters created by Morrison. When I first read the story, I thought they were already existing entities, and as such, "true" Bat-fans would immediately recognize them. Apparently, no. So right away I felt a bit better about my lack of Batman continuity knowledge. And for whatever reason, this took away that feeling (though it was misplaced) of being lost from the beginning and it helped me as I continued through the book. Reading Morrison's commentary about each issue after reading each issue also helped, and I found myself starting to agree with something the writer kept repeating in the interview. Stories don't have to answer all of the questions that they generate. Especially a story such as RIP, that puts the reader into the "mind frame" of a main character who has, apparently, gone insane. 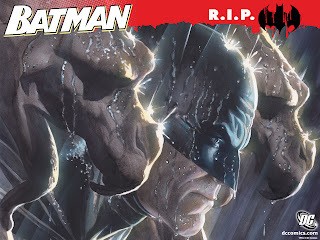 In RIP, we witness (through his eyes) the tearing down of the previously unshakable mental resolve of Batman. We see what happens when a group of villains--a group of villains who not even Batman knew existed, let alone the reader--finds a way to break Bruce Wayne's mind. And we get to see how Bruce Wayne/Batman deals with such an attack. And, while the great Mystery of the story was always "who is the masked man that concocted such a diabolical plot?" maybe it's not the most important aspect of the story. I mean, we're reading the book through the (broken) prism of a man gone crazy. So any plot holes or misdirection...kind of make sense within the framework of this particular story. Now I think this is something that can be misconstrued as a case of, "just because the writer knew what he was doing does not excuse poor writing." And that's the thing. Say whatever you will about Morrison and RIP, but you cannot say that it was a case of poor writing. 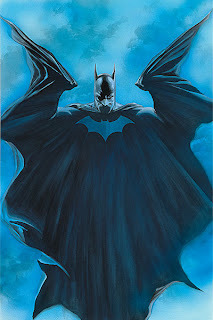 But what I really came to love about Morrison's take on the character is the notion that the different eras of Batman stories all represent a small span of time in Batman's life, and even the most bizarre stories have a sort of place in the character's past. And, since this is a story about a man losing his mind, and being confused by/with memories of events that he may or may not have actually experienced...well, Morrison's take on continuity makes sense. The medium is designed to tell a never-ending string of stories, remember?